Keri Russell as Elizabeth Jennings. Elizabeth’s double image in the Americans pilot. But Elizabeth’s introduction, wrapped in a visage so far from her natural one, is useful for a single image. As she talks to the government agent, the frame is bookended by her image as if there are two of her, one on each side facing the other. One is a reflection from the glossy mirror just to the right of the government official, the other the real thing. 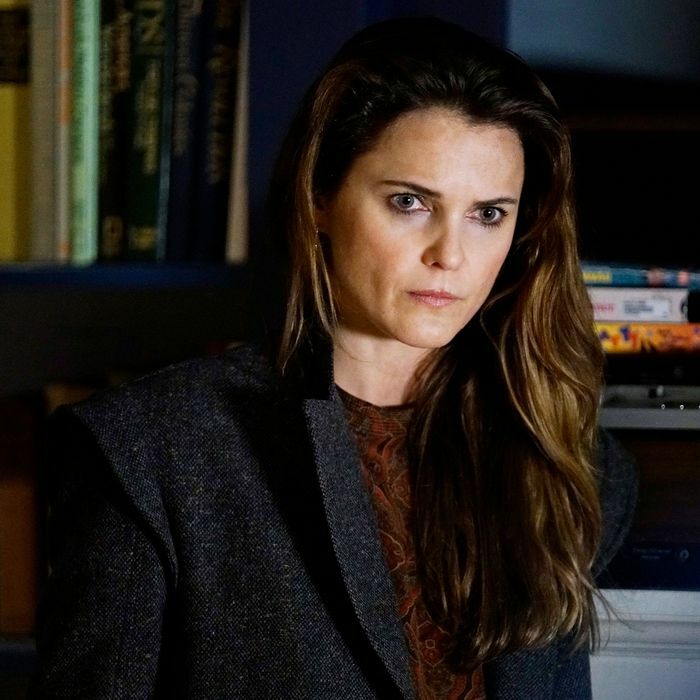 “Real,” of course, isn’t a fixed stage on The Americans, but a forever mutating beast. Looking back over the course of the show’s brilliant six seasons, this image bluntly communicates that, at its heart, The Americans has always been about identity — its evolving state, influenced by a host of factors seen and unseen. This isn’t just true for Philip and Elizabeth, with the various, sometimes painfully elaborate disguises in their arsenal, but every person in their orbit, no matter creed or profession. But it’s Elizabeth, with her hard-line, slavish, and often myopic dedication to a Soviet Union that no longer quite exists, who says the most about identity, thanks to the multi-faceted, luminescent work of Keri Russell. It’s easy to get lost in the arch reconstructions of Elizabeth. Like any acolyte of the series, I have my personal favorites, like Patty, the Mary Kay seller who ended up being one of the most revealing for Elizabeth. But Russell’s most transcendent and emotionally realized work as Elizabeth is when the masks she wears — as a wife, mother, and Russian spy — slip. These transitory, private moments, when Elizabeth suspects no one is watching or can see her clearly, are the most revealing. It’s here, when Elizabeth must bite back rising anger, memory, or regret, that Russell allows emotion to sweep through her like a thunderstorm, leaving her for just a moment exposed. And it’s these moments where Russell proves that she is giving one of the most complex performances ever on television. Russell is a performer who speaks volumes in the quietest, most fleeting moments. She is neither frustratingly opaque like the younger, new crop of actors including Rooney Mara, who read as inscrutable, forcing audiences to project onto them rather than let them in. Neither is she an actor like those who populate the Golden Age of Hollywood, privileging pleasure and persona with fierce brio like Bette Davis, or a charming yet uneasy edge of mystery like Cary Grant. She doesn’t fit neatly into the harsh strictures of Method acting, either. Her performances are beguiling, and difficult to pin down. Russell was only 15 when she got her start as an actor, in 1991, appearing for a few seasons on The Mickey Mouse Club. She lacks the grating affectations that most child actors fail to lose when they transition into adulthood, perhaps because the iconic role that led her to become fixed in the pop-cultural imagination came a bit later, with her titular role on the WB drama Felicity, which ran from 1998 to 2002. On the show, Russell played Felicity Porter, a student who travels cross-country to follow a guy to college in New York. In the role, Russell is earnest, and a bit reticent, with a genuine glowing warmth that makes her immediately easy to root for. Placing Russell’s most iconic performances as Felicity Porter and Elizabeth Jennings side by side, you can see the vast physical and emotional terrain she can handle as an actress. Russell is also a study in how to slough off the identifiers of an iconic role to find new grooves in your career. Finding icon status on TV is tricky — it can be difficult for anyone to see you beyond how they first met you, especially in a role that speaks to such a tender, personal time as college. (Arguably a crucial reason behind the intense reaction when Felicity cut her flowing curls in season two.) But what Felicity and Elizabeth share are that they are two women in different states of transition, finding new answers to the essential question: Who am I? On The Americans, the answer to the question of who you are is complicated by love. Love of country, love of family, love of self. Elizabeth puts her love of country first. It remains unwavering, even when you expect it to buckle under the immense stress of the sacrifices asked of her. In the first season, that sacrifice came in the form of Gregory (Derek Luke, radiating easygoing charisma), a black radical Elizabeth had emboldened to join her cause, who is also her first real love. Gregory is killed at the end of the first season in a police shootout. A lesser show would move on, but Russell plays Elizabeth as if each step is weighed by the accumulation of her losses and tragedies. In the fourth season, Gregory is brought up again in a scene that encapsulates Russell’s tremendous skills. In season four’s “The Magic of David Copperfield V: The Statue of Liberty Disappears,” Philip is devastated when his target, Martha, whom he had a close relationship with, is sent to the Soviet Union. Elizabeth tries to offer an olive branch of sorts by attending the EST classes Philip has looked for solace in. When they talk about how she feels about the classes, her voice is falsely delicate, and a touch condescending, almost as if she’s talking to a child. Philip senses she doesn’t understand EST, and things escalate from there — the careful façade cracks, and her anger spills forth. “At least she’s alive. You didn’t have to send her out on the street to get mowed down,” she yells, referencing Gregory. Philip is shocked by the realization that Elizabeth still thinks of Gregory. While she’s prone to anger as a person, this explosive argument reveals something different: how deeply she holds in hurt, and how adept she’s grown at hiding it. Russell leans into the anger, her face growing flush, a vein bulging in her forehead, her posture poised as if willing to not only yell, but draw blood. This moment demonstrates her excellence at shifting emotions abruptly, revealing hidden depths and secret hurts that add dimension to Elizabeth’s emotional terrain. Russell’s scenes with Rhys in particular demonstrate her quicksilver complexity. At times she’s distant, blunt. Other times her silence offers the chance for a more genuine love or understanding to bloom. This season, their marriage is the most stressed it’s ever been. But lately I’ve been thinking about her scenes with other women — her now college-aged daughter Paige (Holly Taylor), who is following in her mother’s bloody, ragged footsteps; the marks she’s grown friendly with, making the horrors of her job more difficult; her mother and mother figures, who bring the price of her decision to the fore. Season four explored a dimension previously unseen in Elizabeth: how she handles a genuine friendship with another woman. One of her new personas was Patty, a Mary Kay salesman with flowing blonde locks and a penchant for bright, neon clothing. She befriends Young-hee Seong (an excellent Ruthie Ann Miles), a fellow Mary Kay consultant whose husband, Don (Rob Yang), has access to security codes Elizabeth needs to retrieve. A relationship like this requires something more elusive from Elizabeth than simple lust or outright brutality. The friendships that take root between women don’t have the same cultural scripts as a love story or seduction. They take more elaborate forms, which means more risks. It’s evident in the scenes that Elizabeth, as Patty, shares with Young-hee that something tender and even genuine is being coaxed out of her as they cook traditional Korean dishes or discuss the way family has shaped their lives. Elizabeth likes her. When she’s with her, her smile is wide and bright. Her laughter has an easygoing flutter, reminding me in moments of the way she opened herself up to Gregory in the first season. As Elizabeth marches toward the final moments of this assignment, pain twinges at the corners of her expression. In one scene, when she uses babysitting for Young-hee’s three kids as a cover to search her home, there is a moment as the couple drives away that caught me. The easy smile melts from Elizabeth’s face, replaced with a grim determination. These quick turns of emotions are what Russell excels at, but during the Young-hee arc, they also have a layer typically unseen in Elizabeth’s steadfast dedication to her cause: regret. It would be easy to make Elizabeth’s anti-heroism (especially in contrast to Philip’s more openly resistant posturing toward the Soviet Union and wounded demeanor, which makes him more easy to read) tip into villainy, or play her with such a chilly air, she’d seem inhuman. But Russell consistently depicts Elizabeth’s calculations and hardened outlook with precise empathy and care. The Young-hee story line ends in utter emotional devastation. I won’t get too lost in the details, but it involves drugging Don so he’ll believe he slept with Elizabeth, faking a pregnancy, then suicide, and ghosting from Young-hee as she starts to recognize something is going on with her husband, although she’s unsure of what. The last we hear of Young-hee is a phone call. Swaddled in a rich, plum-colored coat, Elizabeth grows tense as she is connected to Patty’s voicemail through a pay phone. On the other end is Young-hee, her voice rising with worry. She notes that her husband seems different, although she can’t discern the particulars of his mood. But most noticeable is her loneliness as she asks where Patty has gone. Elizabeth’s face tenses with guilt and yearning; then she hardens once more, hanging up before Young-hee’s message ends. It’s a brief scene, but it exemplifies the clarity of emotion Russell is able to communicate. Yes, Elizabeth is often blunt, rough-hewn, and intense. But she’s never been predominantly icy. There’s a fire to her. And even when hiding her true nature, Russell grants the character certain minute flourishes — her mouth tightly drawn, a change in her posture, a faraway glance as if she’s calculating the risks in every step she takes — that speaks to the roiling emotions and willpower just beneath the surface. In the sixth and final season, Elizabeth’s face tells a story more knotted and painful than ever before. There hasn’t been a single moment in which she doesn’t look, as my grandmother would put it, tired to the bone. Her face is worn as she smokes, constantly — after seducing a mark who sleeps on the rumpled sheets of some hotel, or outside her suburban home, wrapped in sweaters that make her stature look all the more diminutive. Elizabeth has always been a hardened woman, keenly focused on her task. But Russell has, over the course of the series, teased out a desperation in the character. This is a performance designed not to seduce, but to bruise.